I’m certainly no critic when it comes to art and as far as I’m concerned – if I like it, then it’s good. 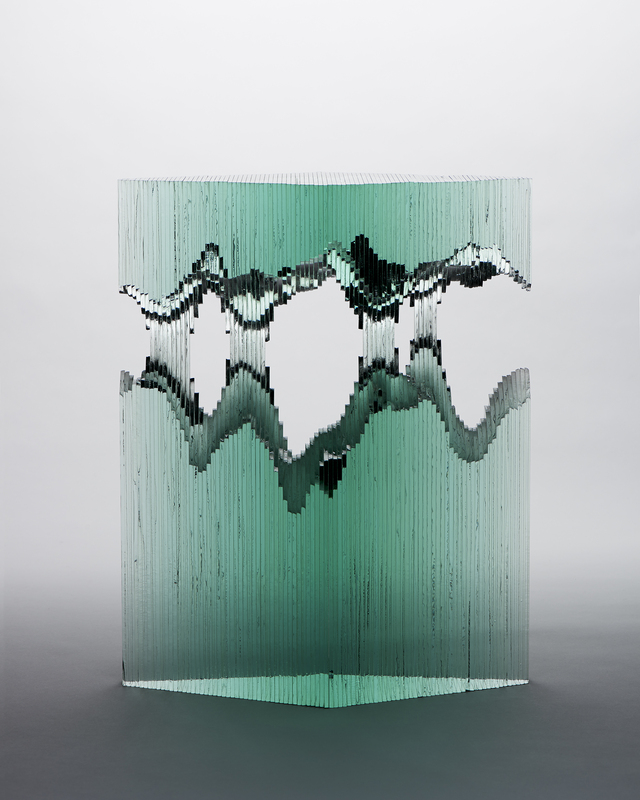 When I first caught a glimpse of Ben Young’s glass sculptures I couldn’t help but stare. There’s something alluring about a sculpture built on the foundations of a product that is generally used for keeping varied elements at bay. I’m not saying glass isn’t handy though – imagine driving a car without a windscreen everyday… did someone say windburn? Ben Young uses glass as his canvas to create some awe inspiring pieces. Ben, a laidback surfer, hails from Waihi Beach, New Zealand, a small coastal town located at the western end of the Bay of Plenty. If you haven’t heard of it, don’t worry, Ben assures me it’s a little off the radar and if surfing or fishing don’t really tickle your fancy, there isn’t much else to do. This lack of activity provided much of the driving force behind Ben’s intrigue into working with glass. 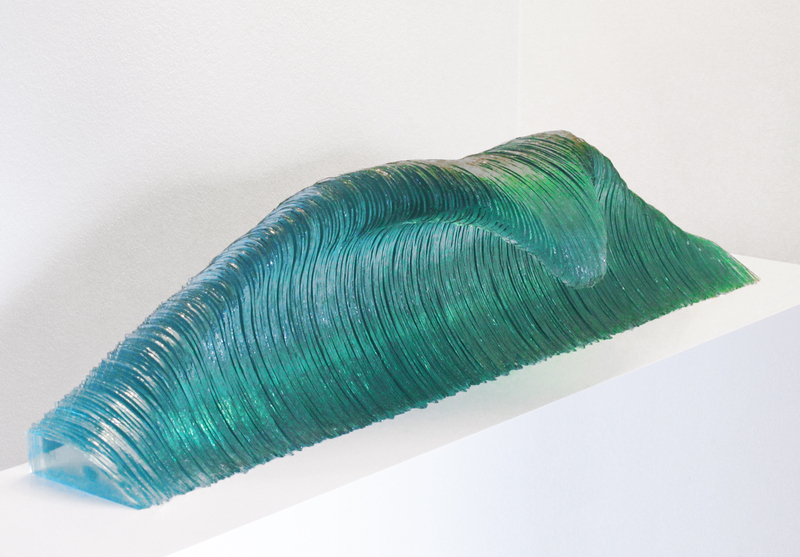 When he was young, he and his family were travelling overseas where they came across a glass wave sculpture in a window display. Ben’s dad, being the tinkerer that he was, decided to make a refined version when they got back home. Not to be outdone though, Ben thought he too could give it a go and possibly make some pocket money in the process. Ben didn’t know if he had the skill or patience to be able to create such things but he jumped on his dad’s tools whenever there were no waves pounding the shores and before he knew it, he was hooked. Glass isn’t the only material Ben works with either. He’s one of those guys that can create something from nothing and restoring old furniture is another little trick up his sleeve. His other talents do distract him from the glass though so he isn’t sure that being a man of many talents is necessarily a good thing. Not to mention the fact that he works full-time as a qualified boat builder. Ben asked me to look at one of his latest creations from a range of angles and I understood what he meant straight away. There were gradients, light refractions, 3D shapes and hidden valleys to uncover. You can’t achieve that sort of unintentional eye candy from a solid material like wood or metal. The sculptures vary from literal to figurative and while some have been commissioned, the majority have been built to satisfy Ben’s own glass addiction. It’s a labour of love no doubt. “I could try a lot harder when it comes to obtaining exposure. Marketing and PR aren’t really my forte but I like to think that if you do something good you’ll get the credit that you’re due. I should be more proactive when it comes to entering into exhibitions and competitions though. “Four years ago I made it into a major exhibition in New Zealand. Twenty glass artists were invited to exhibit at a public exhibition. They wanted to showcase my development as an artist so I showed them some of my early waves and then a life size female torso.,” Ben explains. 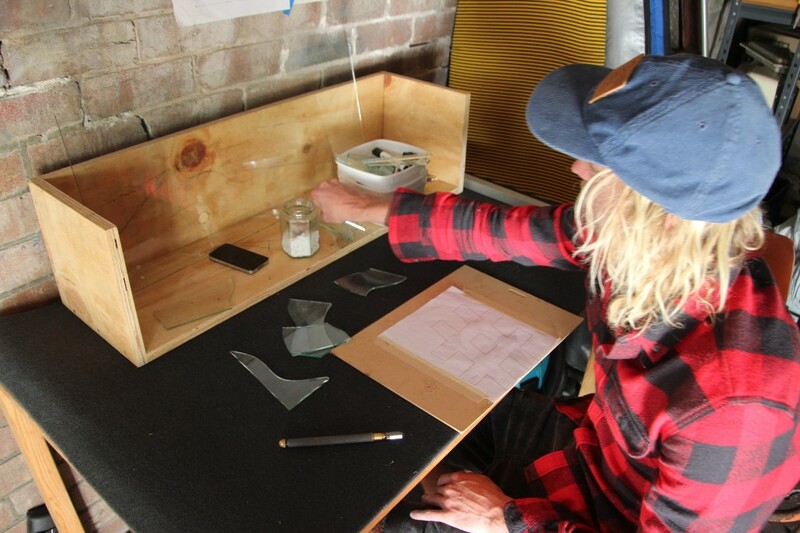 It’s hard to believe Ben creates such beauty in this makeshift workspace within his shed. Ben wasn’t really into art at school but did study woodwork, metal work and tech drawing. No doubt he learnt some skills that lend themselves well to everything he engages in today. It also explains how all of his sculptures are built from hand without any machinery or technology. 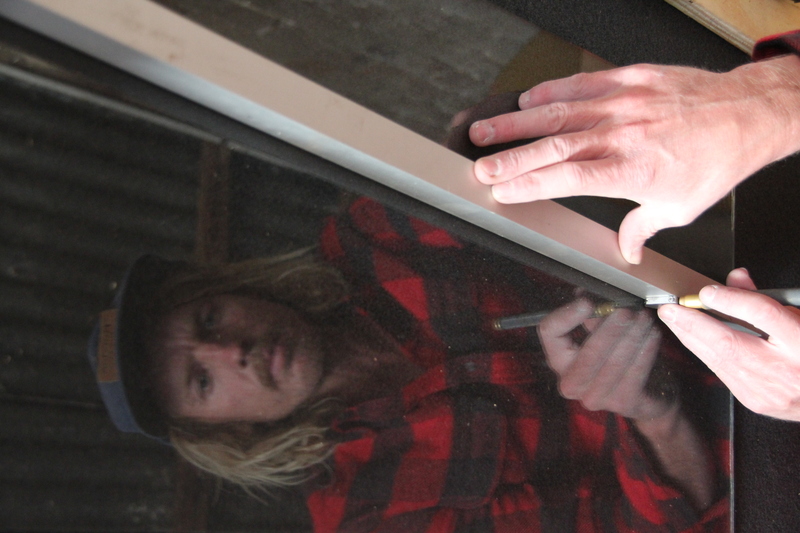 A simple oil-filled glass cutter is his tool of choice and he uses it with precision. For those who aren’t familiar with the tool, the oil continually lubricates the diamond cutting wheel at the base which ensures a nice scratch is achieved. A score on the surface allows Ben to break the glass along his desired path and while plenty of small wounds have been inflicted, he hasn’t experienced any real injuries… touch wood. Computers aren’t really his strong point so every idea begins in his head before he knocks up a few sketches in his sketch book. “I know these days it’s all about computer generated designs but I’m at an age where we learnt tech drawings at school. I never really learnt the computer side of things but I think that adds to what I do. I like the freedom you get without actually having a purpose or a strict diagram to work off. As soon as I start something and put ideas together, that’s when the next idea kicks off. I have a tendency to avoid making similar pieces. Once I’ve made something I like to move on and make something different,” he explains. Ben’s most recent works form a series which hasn’t been named yet. He wanted to come up with some conceptual designs rather than produce something that was recognisable straight away. A lot of his early work was very literal and not being one to rest on his merits, he felt another challenge was required. “I like the idea of people really having to look at my work before forming an opinion as to what it is. While sculpting glass is certainly one of Ben’s outlets he does confess to having too many hobbies and not enough time to fulfil them all. He loves photography, surfing and skateboarding… and he’s good at all of them too. “Sometimes I’ll work four days a week and then work on the glass on my day off. Earlier this year I took two months off which is when I made the unnamed series. I’m fortunate that my work is flexible in that sense,” Ben says. He estimates that the largest piece in the series is made up of 125 sheets of glass all individually marked and cut according to the design in his head and on the drawing board. The straight cuts are a lot easier than the curves and there is a definite technique required to avoid air bubbles when flooding the glass with glue. Speaking of which, Ben uses a glue that sets under a UV light. If any glue comes into contact with air after escaping from the outer edge of the glass, it won’t set which makes clean up nice and easy. An artist and his canvas. 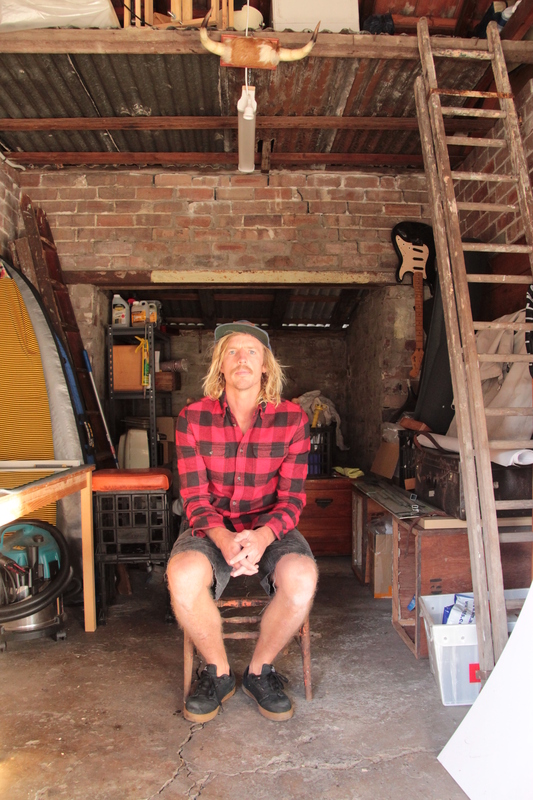 A recent move to Bronte, Sydney, meant that Ben’s shed was still a work in progress when I visited but it certainly has the potential to become a space in which he can continue to harbour his talents. He has plans to turn it into an inspiring space that makes him want to spend more time out there. With his ability to restore just about anything I’m sure it won’t be too long before that happens. Sheets of glass are stacked against one of the walls with a temporary work bench located on the other. The back wall houses a couple of surfboards and there’s a small mezzanine perched above. It’s a simple space but it’s his and once you realise what can be created in there, it makes you wonder what could eventuate once his vision for it becomes a reality. With a supportive (and fellow creative) fiancé by his side, an undeniable talent and a creative space in the works, it seems this laid back sculptor has a lot going for him. His dream of one day holding a solo exhibition could be closer than he thinks.